NOTE: In colloquial speech you can omit either the phrase ช่วย chûai or หน่อย nòi or ได้มั้ย dâai-mái when speaking to someone who is close to you such as your family members or close friends. Could you speak slowly please? chûai pûud cháa- cháa nòi dâi mái? Could you speak again please? chûai pûud ìik-tii nòi dâi mái? Could you open the door please? chûai bpèrd bprà-dtuu nòi dâi mái? NOTE: ช่วยด้วย /chûai dûai/ means “help me” generally and it is only used when you really need help urgently and you can shout it out loud i.e. if someone snatched your bag, then you can yell ช่วยด้วย /chûai dûai/. He/She cooks for his/her mom. The female seller lower the price of the shirt for her regular customer. BE CAREFUL! We use a different pattern between “asking someone to do something” and “asking to have something”. If you would like to ask to have something, learn how to ask with another lesson here. 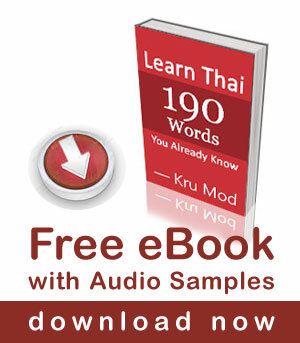 thank you khun mod, this was an excellent lesson. In the examples you give below the video, you use อีกที for ‘again’. Could you explain a little more about this term. Can it be used anywhere that you would use ‘again’? Is it different to อีกครั้ง? I just wanted to say thanks for making these. Finding book audio is very hard where I live.